The 2017-18 wrestling season was a unique one for Cougar wrestlers and for fans of Frederick County wrestling. Unique because it marked the first time in a decade without long-time Catoctin Coach Ryan Green, sitting matside and barking commands at his wrestlers. Green, who debuted in 2006 as Catoctin’s head wrestling coach, ended his ten year tenure last season with a 144 and 99 record, making him the most-successful wrestling coach in the school’s history. Green and his dedicated staff, Coaches Rich Gialanella, Garrett Baer, George O’Brien, Brad Maze, Tyler White, and Tracy Eureka, turned out numerous county and regional champions, including one four-time county champ. Green’s athletes, always known for their aggressive, straightforward, and punishing styles, were recognized and honored with the prestigious Fred Burgee Outstanding Wrestler Award at the Frederick County championships three times in ten years, and his squad won the county title in 2014. During his term, he has coached twenty-four individual state medal winners and seven of the nine state champions representing Catoctin High School (CHS). Although Green is no longer at the helm, his coaching style will be easily recognized through the new head coach, Colin Schildt. Coach Schildt was a stand-out wrestler at Catoctin, one of the most successful that the school has ever produced, a three-time county champion, two-time regional champion, four-time state qualifier, two-time medalist, and finalist during his senior year, boasting a career record of 143 wins and 23 losses. Always a leader in the wrestling room, it’s only fitting that the former Green-trained, Kutztown University wrestler lead Catoctin’s lineup. Schildt and his assistant, Bill Orr, also a decorated high school wrestler and possessing collegiate experience at Clemson University, would lead a thin, but scrappy team in their inaugural season. Much like the previous season, the coaches struggled to fill weight classes, and as a result forfeited 18 points in each team contest. As a unit, the Cougars posted a 249-103 record, winning over 70 percent of their individual matches and winning half of their fourteen regular season dual meets. They went 14 and 15 overall, and were named to the “others to watch” category as a tournament team by the Maryland State Wrestling Association, while remaining unranked overall or as a dual meet team. Seven of the team’s eleven participants would qualify for the regional tournament, four would earn state qualification honors, three would become state place-winners, and one would successfully defend his state title, becoming only the second Catoctin wrestler to win multiple state tournament crowns. Although there would be no team placement in each of the two dual meet tournaments, individual accomplishments were plentiful. At the Bauerlein Duals, two wrestlers, including the 145-pounder Wyatt Payne and senior-heavyweight Dennis Pittinger, would dominate the competition and remain undefeated in five bouts. Seniors Zachary Bryant (113 pounds), Ethan Fuss (126 pounds), and RJ Monoghan (182 pounds), would each suffer only a single loss in the tournament. At Catoctin’s debut appearance at the Westminster Duals, three senior athletes, Zachary Bryant, 160-pound Joshua Small, and RJ Monoghan would prevail in each of their nine bouts to remain unbeaten. Fuss would lose only one match in the tournament. At the 2018 Hub Cup, still regarded as one of the toughest tournaments in Western Maryland, five Catoctin wrestlers advanced to the medal rounds and the squad placed fifth in a field of fourteen teams. RJ Monoghan and senior Nolan Brightshue (138 pounds) each placed fifth. Travis Fields, the 145-pound sophomore, placed fourth; Ethan Fuss wrestled back to third after a second-round loss; Joshua Small and Dennis Pittinger would place second after losing in finals; and Zachary Bryant would become Catoctin’s lone Hub Cup champion. Frederick County continues to be the authority on wrestling in the state of Maryland. Year after year, Frederick County wrestlers continue to raise the bar and achieve an unparallelled success that simply overshadows other programs statewide. With only ten public high schools representing the county, the number of state champions and place-winners that are consistently produced by these ten schools every winter is astounding. Last year alone, Frederick County claimed eight of the twenty-eight state champions, and placed twenty-two of the thirty-four wrestlers that qualified. This year, Frederick County wrestlers accounted for five of the fourteen state champions and seventeen place-winners. Even more impressive, over the past ten years, Frederick County has produced forty state champions and one hundred seventy-one medalists, a testament to the widely-held notion that the Frederick County tournament is often regarded as more competitive than the regional or state contests. Catoctin placed fifth as a team at the 2018 Frederick County wrestling championships, advanced seven wrestlers to the medal rounds, and celebrated three county champs. Zachary Bryant pinned his way through the tourney, becoming a two-time county champ. RJ Monoghan and Dennis Pittinger captured their first county titles, winning by decision in finals. Travis Fields, Wyatt Payne, and Joshua Small each wrestled back to collect third-place medals after losing in semi-finals. Ethan Fuss, the 2016 County champ, saw no action due to a concussion. Although Matthew Linker, the 220-pound sophomore, earned fourth-place honors, he did not qualify to advance to the regional meet. He ends the season with 6 wins and 7 losses and has a career total of 14-25. Nick Veronie, the 132-pound freshman, was eliminated from the contest after two losses, but saw significant varsity action during the year. He won several dual meet matches, as well as bouts at Bauerlien and Westminster, finishing his first season with 8 wins and 20 losses. Nolan Brightshue, the 138-pound senior, failed to advance to regionals after two losses. He was 5-3 in regular season duals, won three matches at Bauerlien Duals, was 6-3 at Westminster, and 4-2 at the Hub Cup, placing fifth. He finishes the year with 18 wins and 12 losses and his career with a 43-35 record. Ryan Orr had his work cut out for him as a 170-pound freshman. He won 50 percent of his matches, including a victory at the Frederick County tournament, and concluded his first year of high school wrestling with a 5-5 tally. The Cougars captured a fifth-place team finish at the 1A-2A West Regional tournament by advancing four of seven qualifiers to the medal rounds, including a third-place finisher, three finalists, and one regional champion. The field expanded to twenty-three teams, up from seventeen teams last year after a state-wide restructuring. The addition of six teams, including the robust squads of Oakdale and Poolesville and the all-powerful Damascus line-up, made the mighty West, statistically Maryland’s best region for wrestling, an even stronger and more dominant force. For the past three years, nearly half, 41 percent, of all place-winners at the state championships represented the Western region, 103 of 252. This year, the trend continues. Over 40 percent, 35 of the 84 place-winners hailed from the West, including almost half of the finalists, 13 of 28, and just under half of the state champions with 6 of 14. In two weight classes, both finalists represented the West, and in one bracket the West was home to the top three medalists. Zachary Bryant remained unbeaten in the contest by winning two consecutive bouts by fall after a first-round bye. He successfully defended his regional crown, becoming a two-time 1A-2A West champ, and secured the number one seed at states with a 9-1 decision in finals. Ethan Fuss dropped a close decision out of the gate, but fought back to third place with back-to-back pins and a tight victory in a rematch of his earlier loss. Joshua Small fought his way to finals with a first-round bye and two victories by decision only to be uncharacteristically caught and put on his back in the second period of his finals match by the eventual state runner-up. Dennis Pittinger suffered a similar fate. He pinned his initial opponent after a bye in the first round, won by decision in semi’s, and was pinned in the second period of his finals match, again, by the future state runner-up. Travis Fields came up short at the regional tournament for the second time in as many years. After a victory by fall in his first bout, Fields was eliminated with back-to-back losses. However, the 145-pound sophomore won over 70 percent of his matches, an improvement of over 10 percent from his freshman year, including eight regular season dual meet victories, two wins at the Bauerlein Duals, and six triumphant bouts at the Westminster Duals. He went 3-2 at the Hub Cup for a fourth-place finish and 3-1 at the Frederick County tournament, earning a third-place medal. Fields ends his season with a 23-11 record and a career mark of 45-27. Wyatt Payne, the 152-pound junior, was eliminated after a close loss by decision in the pigtail rounds in his second showing at regionals. His progress was interrupted mid-season by an injury that kept him from participating in the Westminster Duals and the Hub Cup, but he claimed a 4-4 tab in regular season dual meets matches, posted a perfect, 5-0 record at the Bauerlien Duals, and went 3-1 at the Frederick County championships, collecting a third-place medal. The Frederick News Post Honorable Mention rounded out his junior season with a 11-6 record and bumps his career record to 54-34.
RJ Monoghan qualified for his first appearance at the state tournament last season as a junior. This year, the 182-pound senior would not be so fortunate. After a first-round bye, he advanced by way of a very close decision in quarter’s only to suffer a one-point loss in semi’s, the match that would have propelled him to states had he won. Monoghan was ousted from the competition after being pinned during wrestle-backs. Although his hopes of making the bracket in the state tournament would not materialize, his senior year was far from uneventful. He lost only two regular season dual meets with a record of 12-2, had an exceptional showing at the Bauerlien Duals with a 4-1 total, and swept the opposition with a perfect 9-0 run at the Westminster Duals. He finished fifth at the Hub Cup and claimed a Frederick County title en route to a 31-7 season record. He was honored with a second team All-area nomination by the Frederick News Post and sports a career record of 91 wins and 50 losses, just shy of the 100 win mark. Catoctin was able to nab another top-ten team placement, finishing 9th, among one hundred seven 1A-2A public high school wrestling programs, up from ninety-nine schools last year after redistricting. The Cougars propelled three of its four qualifiers to the medal rounds during the Maryland state wrestling championships, held for the third year at the Show Place Arena in Upper Marlboro, Maryland. And for the seventh time in as many years, the team celebrated yet another individual state wrestling title, boosting the total to nine (Shane Tiffany 1995, Seth Chilson 2010, Tim Nordan and Charlie Perella 2013, Wayne Wivel and Charlie Perella 2014, Charlie Perella 2015, Zachary Bryant 2017, and Bryant again in 2018). Dennis Pittinger, the 285-pound senior, would make monumental gains during his high school career. As a 182-pounr freshman, Pittinger faced the obstacle of being in a weight class often dominated by seniors. He won 22 of 45 matches, a winning percentage of 48 percent. After a brief absence during his junior year, Pitinger returned to CHS and posted some spectacular stats, including a state tournament bid where he pinned his first opponent in just under four minutes. A loss in quarter’s pushed him to the wrestle-backs where he, again, won by pin. He was poised to celebrate a spot on the podium and secure a state medal with one more victory. Unfortunately, he lost by a single point to the eventual third-place winner and was bumped from the contest. His impressive season included a perfect 14-0 regular season dual meet record, a flawless 5-0 Bauerlien Duals total, and a 6-3 showing at the Westminster Duals. He fought his way to the final round of the Hub Cup, placing second, and blanked the competition at the Frederick County championships en route to his first county title. He placed second in the regional tournament and qualified for his second appearance at states. The Frederick News Post All-area 1st team nominee is ranked number eighteen in the state by the MSWA and racked up a winning percentage of 88 percent with a season record of 33-7. He wraps up his high school career with a commendable 81-32 total. Ethan Fuss, the 126-pound senior, made his third appearance at the state tournament. No stranger to the big stage and the advanced competition, he placed fourth as a sophomore. Fuss looked promising with a 10-2 victory in prelim’s, but dropped a tough, low-scoring, 5-2 match in quarter-finals. After winning two consecutive matches in the lower bracket, including one by pin, which guaranteed advancement to the medal rounds, something strange happened. During the match that would have thrust him to wrestle for third place had he won, Fuss was unexpectedly and unjustifiably disqualified from the tournament, leaving the fans confused and in disbelief. The referee had clearly lost control of the match, evident by his failed attempts to slow the wild pace of the match and gain control of the contestants. Fuss has always been a physical wrestler, bluntly unintimidated, and one to counter aggression with his own offensive charge. He displayed his eye-for-an-eye style during the bout, and his actions were well within the legal bounds of sportsmanship. It appeared, however, that the actions of his opponent were not only bordering on illegality, but were outright malicious, and that the wrong athlete may have been punished with ejection. The impending decision to disqualify Fuss resulted in the forfeit of his final two high school matches, and he would be forced to accept a 6th place finish. With a season winning percentage of over 80 percent, Fuss still had plenty to celebrate, including an 11-3 regular season dual meet record, a 4-1 performance at the Bauerlien Duals, and a near-perfect record of 8-1 at the Westminster Duals. He fought back from an early loss at the Hub Cup to earn third-place honors and qualified for states by placing third in the region. He was nominated to the Frederick News Post’s All-area 1st team and is ranked at number fifteen by the MSWA. He finishes his senior year with a season record of 32-10 and increases his career totals to 121-41. Joshua Small, the uniquely calm 160-pound senior and already the owner of a pair of state championship medals, has had plenty of post-season wrestling experience. The four-time state qualifier came away empty handed as a freshman, but finished in fifth place his sophomore year and earned a third-place medal last year as a junior. Employing a no-frills, practical, and deliberate wrestling methodology, he would add yet another piece of hardware to his collection. This year, Small came out efficient and strong, pinning his first opponent in under two minutes. He was forced into the consolation bracket after a close, 3-1 loss by decision in quarter’s, but then cranked out three consecutive victories, one by pin, another by major decision, and a third by injury default, that would advance him to the third-place round. 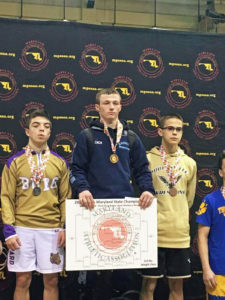 Unfortunately, he would settle for fourth after a hard-fought 9-4 defeat, but was able to stand on the podium at states, unrattled, for the third time in his high school career. Small’s senior year was nothing short of extraordinary. He posted a perfect, 14-0 regular season dual meet record that included a seven-second pin, the fastest of the season, against Walkersville. He went 3-2 at the Bauerlien Duals and swept the competition with an undefeated showing at the Westminster Duals. He was a finalist at the Hub Cup and wrestled back to place third at the Frederick County tournament after a loss in semi’s. Also a finalist in the regional tournament and placing fourth at states, Small would put together a superb 37-7 season record, winning almost 90 percent of his matches. The Frederick News Post All-area 1st team selection is ranked number twelve in the state by the Maryland State Wrestling Association, and he tops off a exceptional high school career record of 130 wins and 46 losses. Zachary Bryant, the defending state champion, held the number one seed for the second year coming into the state championships. The exciting and daring four-time qualifier came away with a pair of fourth-place medals, representing his freshman and sophomore year, and celebrated his first state title as a junior. The persistent 113-pounder made quick work of his first opponent by pinning him in just twenty-two seconds. Another pin in quarter’s and a hard-fought, 4-2 decision in semi’s afforded Bryant the opportunity to repeat his previous success in finals. He did just that. Winning a 6-3 decision against an opponent that he had been victorious against twice before in the season, the unrelenting Bryant was crowned Maryland’s 1A-2A, 113-pound state champion for the second time in as many years, and Catoctin High School’s 9th individual state champ. His distinguished season included an unbeaten 14-0 record during regular season dual meets, a 9-0 tally at the Westminster Duals, 1st place honors at the Hub Cup, the county championship, the regional championship, and, of course, the state tournament. His only loss of the year came at the Bauerlien Duals, early in the stretch, where he posted a 4-1 record. He had a winning percentage of 97 percent, and was honored with a first team bid to the Frederick News Post’s All-area team. Bryant is ranked third in the state by the Maryland State Wrestling Association. He finished the season with a near-immaculate 38-1 record and a career total of 143 wins and 18 losses, tying Coach Schildt’s 143 career wins and firmly in third place for all-time wins at Catoctin High School. Zachary Bryant (center), 113 pound state champion.